Being surrounded by water of the sea and the rivers, a number of water activities have become a part of tourism in Goa. Catamaran sailing is a relatively new entry into the water sports of Goa. It is fast gaining popularity among the adventure loving tourists. Most of the beaches of offer facilities for catamaran sailing in Goa. Catamaran sailing is also called Hobby Cats. It is a very relaxed sport, much like conventional sailing, which is more of a leisure activity than a water sport. You can enjoy the natural beauty of the Goan beaches and the Arabian Sea during catamaran sailing. The leisurely pace of the catamaran is ideally suited for the carefree ambience of Goa. Catamaran sailing can be a perfect way to enjoy a honeymoon holiday in Goa. You can also have a whale of time if you are with friends, business associates, while catamaran sailing together. Benaulim, Dona Paula, Calangute, Colva, and Utorda are the major Goan beaches for catamaran sailing in Goa. 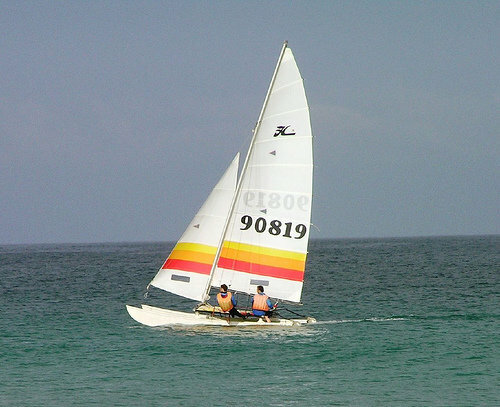 Catamaran sailing is fast becoming one of the most popular water activities in Goa.